Kristine Gale and her 1953 Vagabond trailer. Photo courtesy of Herald/Review. You may be asking yourself, “What the heck are alternative lodging parks? !” This story begins in the small, historic mining city of Bisbee, population 5,300 in southeastern Arizona and with a vintage 1953 yellow Vagabond trailer. An entire volume could be written about the drama that divided this community over the controversial placement and the residential occupancy of this trailer in a zoning district that allowed manufactured homes but not recreational vehicles or vintage travel trailers. Some thought it was an eyesore while others supported the right of Bisbee’s residents to live in affordable housing. The upshot of the story involves zoning enforcement, a populist decision made by the local Board of Adjustment in contradiction to the staff’s recommendation, an appeal of the board’s decision and, finally, a dismissal and settlement that seemed to placate both sides of the controversy - for now. A very good summary can be found in this article in the local paper, the Herald/Review: https://tinyurl.com/yc5h9alp. 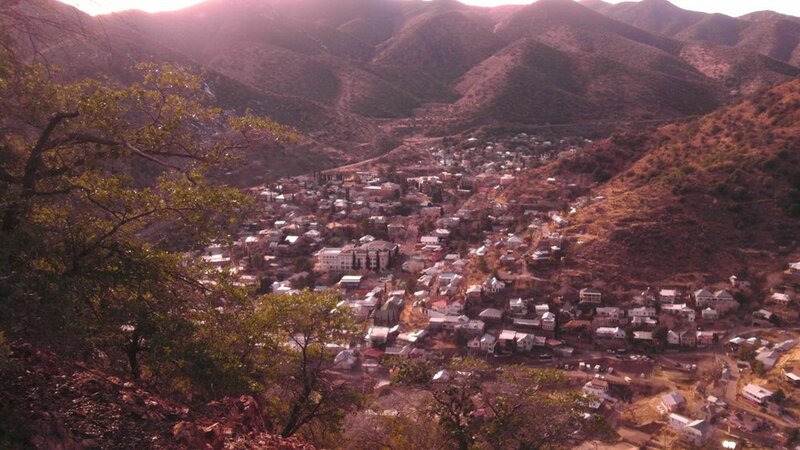 Bisbee, Arizona sits about 90 miles southeast of Tucson and is the county seat of Cochise County. Photo by Mark Apel. The discussion about RV and manufactured home parks brought to light, or I should say ‘opened up a can of worms,’ on the issue of accommodating manufactured home parks, pre-HUD standards mobile homes, portable tiny homes, permanent tiny homes, vintage travel trailers, modern recreational vehicles, campers, tents, park models and anything else that didn’t exactly fit the standard definition of single or multi-family residences. Pre-HUD standards mobile homes had, some time ago, been disallowed in both the city and in the county outside of the city limits. In the county, they were allowed only if they were rehabbed to meet building and safety codes per the Arizona Department of Housing, Office of Manufactured Housing minimum rehabilitated mobile home standards. This was due to safety concerns such as the lack of proper venting for water heaters and sub-standard wiring found in mobile homes. At the time, Bisbee didn’t have the capacity to inspect rehabilitated mobile homes, so they were just disallowed outright. In a city that prides itself on its designation on the National Register of Historic Places and tourism, the question became how to craft or amend the zoning regulations that would equitably consider the merit of any of the types of alternative lodging described above? The Commission embarked on the traditional approach of considering a new section in the zoning regulations for RV and manufactured home parks by investigating county regulations and those of other western jurisdictions, including pages and pages of standards applicable to this particular type of land use. What became abundantly clear was that the Commission was in for a very long ride if they continued down this road. It was also clear that they had an obligation to consider the issue of affordable housing in a community where housing prices are becoming out of reach for many of its citizens including low-income residents and workers for Bisbee’s growing tourism sector. At the same time, Bisbee was missing out on the potential for expanding its tourism opportunities for out of town visitors. The West has countless examples of RV parks and campgrounds that accommodate winter visitors for long periods of time. Many cities and towns see a substantial uptick in their populations between the months of October and April as snowbirds from colder climes in the US and Canada take up semi-permanent residence in sunnier, warmer Arizona. Alternative Lodging Park shall mean a temporary or permanent use that allows a variety of housing options including manufactured and mobile homes, recreational vehicles, travel trailers, tiny homes and temporary camping facilities that may be granted by Special Use Permit on a case by case basis in any zoning district. The proposed park will require at a minimum a detailed site plan that identifies the number of unit spaces, access points to public streets, internal circulation, buffer zones, and screening devices, open space/recreational facilities and additional buildings, etc. The minimum parcel size for a proposed Alternative Lodging Park shall be one-half acre with a maximum parcel size of 5 acres. The maximum units per acre for any park will be determined by the Planning Commission based on site conditions. All manufactured homes to be sited in an Alternative Lodging Park are subject to the minimum standards in Article 6 General Provisions, Section 6.7 in the Bisbee Zoning Code. All pre-1976 rehabilitated mobile homes are subject to the Arizona Department of Housing, Office of Manufactured Housing minimum rehabilitated home standards. Refer to the tiny home definition for the minimum building code standards. The adopted definition does not include the provision of subdividing and selling lots within a park. An entirely different subdivision process and regulations would apply to that kind of proposal. However, the adopted definition includes enough detail for any prospective applicants without getting into the weeds about required setbacks, numbers or size of spaces, etc. Instead, it provides the general requirements that will be reviewed on a case by case, neighborhood by neighborhood basis. In the public hearings that took place for amending the zoning regulations with this definition, some residents were concerned that this definition would open up the city to low-rent and unappealing mobile home parks. Because Alternative Lodging Parks are a discretionary decision and not a use by right, the onus is on the applicant to submit a very detailed and well-thought-out application and concept plan – one that will be reviewed by the public in addition to the city staff. The city’s Special Use application requires specific detail to be included with every concept plan in addition to the features required in the definition of Alternative Lodging Park. Likewise, the Zoning Regulations outline specific criteria to evaluate all special uses, such as the mitigation of off-site impacts, compliance with site development standards, adequate services, and infrastructure, to name a few. A special use application and concept plan are considered by the Planning Commission through a public hearing, giving the public a chance to submit or voice their opposition or support for the application, as well as an opportunity for the applicant to address any concerns. The Commission then makes a recommendation for approval, approval with conditions or denial to the City Council, who makes the final decision through another public hearing. Alternative Lodging Parks open up the realm of possibilities to the most innovative and creative proposals that tastefully accommodate different types of lodging – such as tiny homes – while providing affordable lodging opportunities for travelers and residents alike. Any application will need to be mindful of Bisbee’s historic, artistic and touristic appeal. Bisbee residents are known for thinking out of the box since many are artists, activists, authors, world travelers, retired miners as well as a whole host of others from varied backgrounds. While this new definition has only recently been put on the books and not yet been put to the test, time will tell if Alternative Lodging Parks will add to Bisbee’s reputation as “antique, offbeat, affordable and genuine” as described by Frommer’s 18 best places to visit in 2018. Mark Apel works for the University of Arizona Cooperative Extension as an agent in community resource development. He serves on the Western Planner Editorial Board. He previously served as the chair of the Editorial Board and as a member of the Western Planning Resources Board.